The Poetry of the Workshop: Francesca Sasnaitis discusses ‘These Heathen Dreams: Journey of a Cultural Bolshevik: Christopher Barnett’. 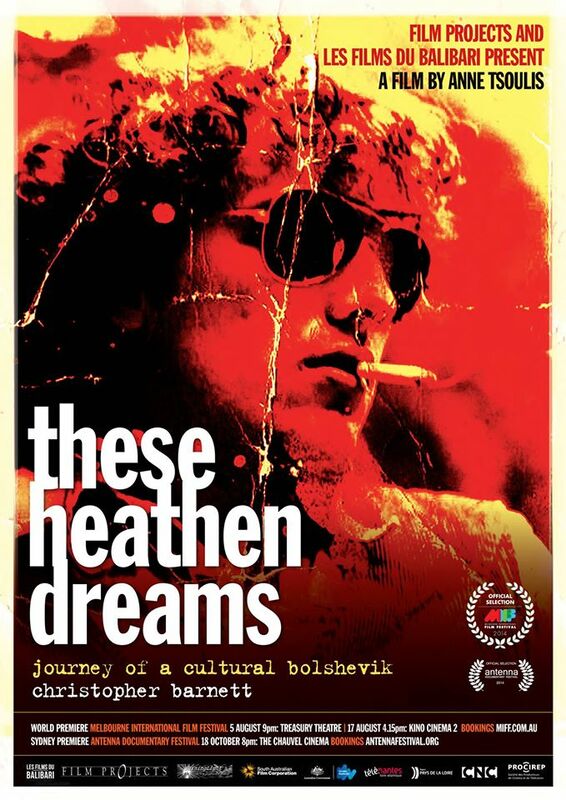 These Heathen Dreams: Journey of a Cultural Bolshevik: Christopher Barnett. Dir/ Prod Anne Tsoulis, Prod Georgia Wallace-Crabbe, Prod Estelle Robin You. Melbourne International Film Festival screening, 17 August 2014. Christopher Barnett and Francesca Sasnaitis. Nantes April 2014. (Photo- Alex Chapman). If I had known I would be asked to review Anne Tsoulis’ documentary on poet, performer and activist, Christopher Barnett, I would have taken a notebook to the screening. But I didn’t, so this will be, perforce, an impressionistic account. Scenes pass quickly on film. Unlike photography, film does not arrest time: even the passage of stills becomes a filmic sequence driving the eye and mind forward. I may be struck by a particular image or a pithy comment, but these are superceded so promptly that I instantly forget what I just saw and heard. The faces of friends appear suddenly, many times larger than life-size. I recognise their voices before I realise who is speaking, then they are gone, and another scene takes their place. The size is disquieting, as is the aging. Of course, we are all so much older now. 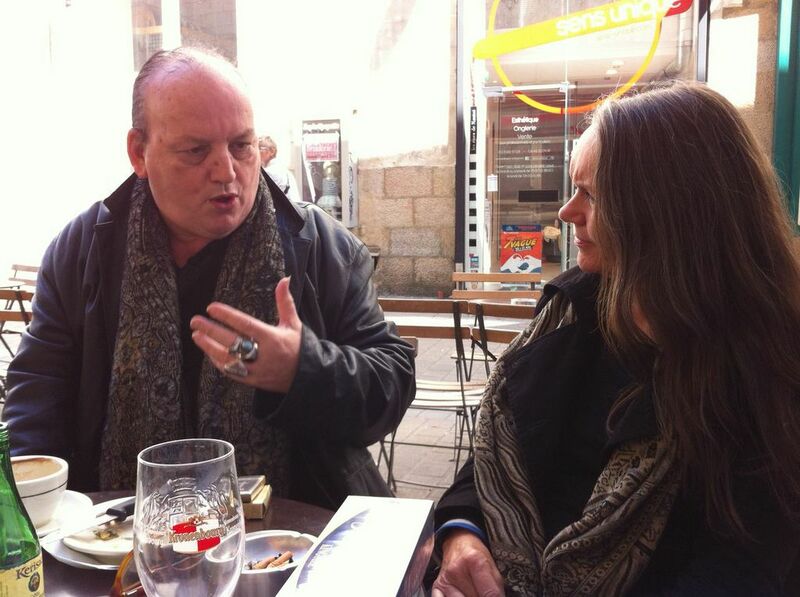 Alex Chapman and I visited Christopher in Nantes in April this year. I had met Christopher in Melbourne in the 1980s, and had reviewed his most recent publication when they came / for you elegies / of resistance for Sydney Review of Books (http://www.sydneyreviewofbooks.com/wave-after-wave/). As we were in France, it seemed like a good opportunity to reconnect. We met at Le Cercle Rouge, a left-wing bar in the centre of the old town. The scene might have come straight from Fellini. All the characters – workers, comrades, activists, loungers – knew Christopher. He was welcomed. He drank innumerable cups of coffee, chain-smoked, and told us his story. We talked all afternoon until our clothed smelled of tobacco and the cold Nantes wind forced us to leave. Tsoulis’ documentary is structured around a visit to Christopher’s dear friend, Thomas Harlan. Radical activist, filmmaker (see Torre Bela, 1977, https://www.youtube.com/watch?v=vLX1BZ3BS84) and novelist, Harlan is much older than Christopher, but both men have been betrayed by their bodies. Both men were handsome in their youth; both are now bloated with the drugs keeping them alive (Harlan died 16 October, 2010). Christopher and the film crew travel through a snow covered landscape, an apt metaphor for ‘the winter of our lives’, and a soft contrast to the bleak architecture of the sanatorium near Berchtesgaden, where Harlan lives. Christopher wears his habitual long leather coat and a pointed leather hat. All in black, he looks like a cross between a 1920s Bolshevik and a Tatar, or a Van Helsing character sweeping across the frozen wastes, still brandishing the wooden stake of his art against the blood-sucking capitalist-bourgeoisie. Christopher’s history and background is fleshed out with photographs and archival footage: a visit to his family home in what appears to be the late 80s or early 90s; a conversation with his mother revealing her love of poetry; his heritage; his brother Michael, also working on a book. They share a mouth. I wonder what it must be like to see yourself on-screen, or your brother. Christopher’s sister and two nephews are purported to be in the audience tonight. Do family members see the family resemblance for the first time, like me, or is it all too familiar and not worth mentioning? Families make the harshest critics, and are the last to acknowledge that a sibling might have changed. What do they think of their radical brother being vindicated, even lauded, by a former Mayor of Nantes and Prime Minister of France, or the current Mayor speaking of Christopher’s commitment to his art, and how art can teach us to see the world anew? Imagine an Australian politician expressing such a view! A parade of musicians, performers, academics, talking heads from his Australian days – Ramesh Ayyar, Marcus Breen, Margaret Cameron, Mario De Pasquale, Paul Kelly, Anne Marsh, Mark Roberts, to name a few – tell stories of Christopher’s wild youth, his crazy talent, how he always had the best looking girlfriends, how his performances were really something. Other collaborators are acknowledged in anecdotes or on film – Nico Lathouris, Graham Henderson – people who could not appear or may not have wanted to. As I search the background of the photographs and footage for faces I might know, I wonder what it would be like to see this documentary without the reference of ‘being there’; without knowing, for example, that Mario De Pasquale is Mario D. from Marios, or even that Marios is Melbourne-famous. His French collaborators are a touch more earnest, giving Christopher credit for his work in shelters, prisons and in mental institutions. They respect his dedication, obsession even, to the ‘poetry of the workshop’ and admire his success with people on the margins of society. One woman says categorically that Christopher, that writing, saved her life. This is Christopher’s fundamental belief, that art can precipitate change. He is again vindicated. I am most moved by the photographs of Christopher as a weedy boy wearing glasses, and his father, a spare man in hat and suit, also wearing spectacles – do I remember this image correctly? There seem to be too many spectacles in the picture. The picture fades but the sound of Christopher’s voice stays. He reads a powerful and personal piece, half lament, half diatribe against the absent tubercular father, who encouraged him to write from the age of eight, who guided him, but who was rarely home on leave from the sanatorium where he spent most of his life. The sanatorium holds contemporary echoes with Harlan’s situation, and I wonder if the older man might not have taken a fatherly role in Christopher’s life. Although they were collaborators, Harlan certainly speaks with authority of Christopher’s failure to engage with the wider public and is still pushing him to publish more. Christopher himself is impressed by Harlan’s will to create. Since his illness, Harlan has worked harder than before. By contrast, illness has made me lazy, says Christopher. As the credits roll we hear Christopher reading from when they came / for you elegies / of resistance, in a voice cracked with emotion for the boy who died, Furkan Doğan, but I think a comment from one of the talking heads (I can’t remember who) makes a more fitting epithet. That person said that everyone Christopher meets becomes his lover. They could not have said a finer thing: he loves. FRANCESCA SASNAITIS is a Melbourne-based writer and artist, currently embarked on a PhD in Creative Writing at the University of Western Australia. Her poetry, fiction and reviews have recently appeared in Australian Book Review, Cordite, Southerly, Sydney Review of Books, and The Trouble with Flying and other stories (Margaret River Short Story Competition 2014). This entry was posted in Anne Tsoulis, Christopher Barnett, Francesca Sasnaitis, Issue 12, These Heathen Dreams and tagged Australian Literature, Australian poetry, poetry, Thomas Harlan, when they came / for you elegies / of resistance by Mark Roberts. Bookmark the permalink.